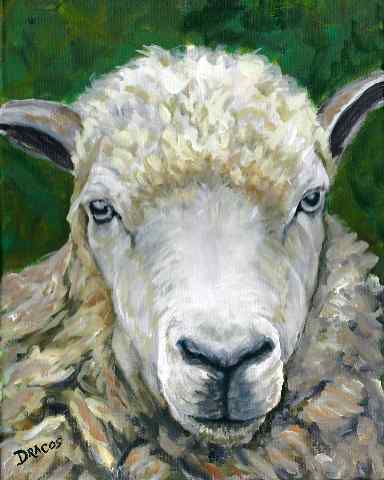 This is an 11x14x3/4" acrylic painting of an American Coopworth sheep that I just finished. Hope you like it. It's looser than I usually paint, and for me, that's really a good thing. I think I built up the form of the animal better by seeing and "feeling" the weight of the wool on its body. It was a good painting day. The American Coopworth sheep is a breed that was introduced into the USA in the 1970's from its original country of New Zealand. Its wool is especially valued by hand-spinners. This sheep's portrait, my first painting of a sheep, was a pleasure to paint, and I gave it as much body and weight as I could manage on a two-dimensional surface. I'm looking forward to painting more sheep in the next few weeks. Here's a minpin painting I just finished for a friend. 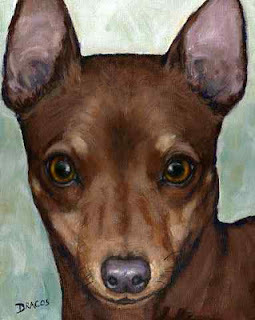 His name is Kaiser, and he's a chocolate and tan miniature pinscher. I'm pretty satisfied with it, but the photos I had to work from were not very clear, but they were all that were available as Kaiser has passed on. I'm now working on a painting of a sheep - yes, a sheep. I'm still trying from time to time to include some farm animals in my repertoire, and I took a trip to several farms around Tillamook, on the Oregon Coast and climbed down embankments and risked getting shocked by hot fences to get photos of these critters, so by golly, I'm going to do some paintings of them. It was a fun trip, though. I had no idea that cows and sheep were so varied in their appearances -- it's a whole new educational direction for me. I'll post it in a few days. This is a German shorthaired pointer painting I finished last week. It's an acrylic painting on an 11x14x3/4" canvas, staples on the back only, and is ready either to frame or to hang as-is (the sides are painted the same color as the background). German shorthaired pointers are such beautiful dogs to me. I find the physical shape of dogs to be interesting and beautiful, and GSP's, like all shorthaired dogs, allow me to focus on the form beneath the hair rather than the hair, which often obscures that form. The most wonderful dog I have ever had (I still can't look at photos of him after almost six years following his death) was a German shorthaired pointer and most likely some kind of hound. He was the most intelligent, friendliest, most most most beautiful dog I've ever had the fortune to spend a part of my life with. His name was Dune, and his adoption was quite unique. I was at an art show, standing in line to buy a cup of coffee, when I saw this most beautiful ever dog, standing in front of me with a young man. I had to comment on his beauty to the young man, and I jokingly said that if he ever didn't want to keep him (and who wouldn't want to keep such a beautiful dog!!! ), that I would take him in a second. The man thanked me, and we both went our separate ways. Later in the day, I was still at the show, and the young man approached me with tears in his eyes and asked me if I was serious about my comment in the coffee line. I was shocked, but I said of course I was. He explained that he was a college student, living in a small apartment, and that Dune (that's the name he had given him) was a bit more than he could handle in his present situation. Anyway, you can guess the rest of the story. Dune and I took a bit of time to bond because he really missed the young man, who contacted me to see how he was doing but thought it best that he not see him again (I agreed with that). But eventually, we became inseparable. He even traveled with me when I had to go away on business. He was a perfect gentleman in the city and a lovable clown in the country, where I lived at the time. He was admired by all who saw him; and on more than one occasion, but many perfect strangers offered to buy him from me for huge sums of money! I lost him most awfully. A few years ago, he and I had traveled together to visit my mother, who unbeknownst to me, had late-stage lung cancer and didn't want me to know until I was with her. On my arrival, I immediately took over her full-time care, actually living in the hospital with her for her last month and a half of life. My brother kept my precious Dune in a pen in his yard as he worked full-time and was visiting our mother the rest of the time. I went to see Dune as often as I could, and it broke my heart to see him because he was so depressed at not being with me for the first time ever. Well, I lost my mother; and during the funeral arrangements for her, my precious Dune died (from what I don't know) - without me, feeling I'm sure completely abandoned, lost, and all alone. I've never gotten over it, to have lost them both within such a short period of time. Well, to this day, my sadness is unspeakable, and this is the first time I've ever written about what happened. He was ten years old, in excellent health when this nightmare started. Rest in peace, Mother and Dune. Unlike I'm sure many artists, I need to paint every single day to be able to keep my confidence and abilities up to par. From around the end of October until now, I have not been able to be in my studio enough - and my confidence level has plummeted. I love my career more than anything else I've ever done -- or ever will do -- in my life. I live to paint and to learn all I can about painting. 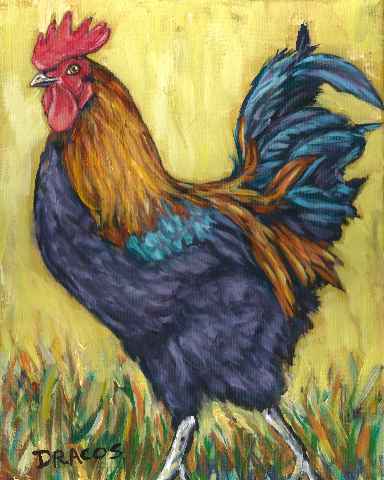 But as much as I love to paint, there's one thing that overrides even it, and that is my family - including extended family and even some friends -- and of course my four-legged family members, too. So that's why I was away from painting these past couple of months. But now it's time for me to get back to it. I started about a week and a half ago with a rooster painting, a bit stylized compared to my usual style, but it was enjoyable, and if felt good to have the brushes wet again. 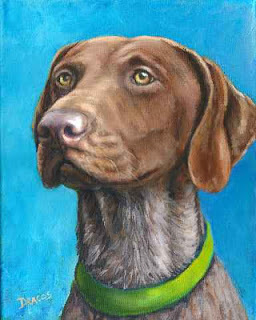 I've finished it, and now I'm painting a German shorthaired pointer portrait. I'm fairly happy with the painting so far, but I'm having a bit of trouble with getting just the right color. Unfortunately, I read the AKC requirements for a GSP's color, which they descibe as pure "liver," not red, not orange, not tan, but "liver." Well, I'm really struggling to be sure it's exactly the right color in my painting, but with a bit of time I'm sure I'll get it right. Here's a painting I did last week. It was enjoyable but difficult at the same time -- I know dogs; I do not know roosters! But we all need to do something at least a little different from time to time, right? He's bright and cheery, though; I have him hanging in my kitchen for the time being. He's going to be for sale in just a few hours at my website, http://www.dottiedracos.com. And I hope you all have a great, great 2012. Happy New Year.